"Remote NANO" was always one of the most popular manager devices for players and instructors because it is compact, convenient and lightweight. However, the previous version of the device had only two most popular commands. Another our manager device Universal remote is able to reconfigure the most popular game parameters on-the-go, but it is not so easy to carry it in the pocket during the game. LASERWAR engineers decided to look for a compromise solution and after having analyzed a set of the most frequently used commands they made a new updated Smart Nano Remote. The new remote control did not increase in size very much, but its functionality grew 7 times! Now, using the new remote, you can trigger the 14 most frequently used commands. And all this can be done with 5 buttons. Four buttons are responsible for selecting the mode, and the fifth button will execute the selected command. - "Anomaly (x2 Health) ". The red button with the triangular LASERWAR logo is an «Enter» button that triggers a selected command. If you press it before selecting a command, a running light will flash through the surface of the remote, indicating that you should first select the operation mode. The upper button allows you to change the color of the player. Press it several times to select color (red, blue, yellow, green). The color will be indicated by X-cross led. Press the triangular button to confirm the command. The flickering of the two LEDs on the sides of the triangle indicates the operation of the IR emitter. The lower button selects the Start / Pause mode. Press it once (you can press it more, but it will change nothing). Then click the "triangle" button. The first click "Pauses" the player, the second - returns him to the game. The right button selects one of starting the game and restoring the health commands - "New Game", "Delayed Start", "Respawn" and "Anomaly (x2 Health)". Select command color code (colors and commands are listed at the pic before) and press the confirmation "triangle" button. The remote control will automatically turn off after 1 minute from the last key press. To save battery power, you can turn it off by holding down any key for 2 seconds. The "Smart NANO Remote" is powered by the CR2032 battery. Operation time is 1-6 months depending on use intensity. If not used it can work up to 7 years from one battery. "Remote NANO" was always one of the most popular manager device for players and instructors because it is compact, convenient and light weight. However, this device had only two most popular commands. Another our manager device Universal remote is able to reconfigure the most popular game parameters on-the-go, but it is not so easy to carry it in the pocket during the game. 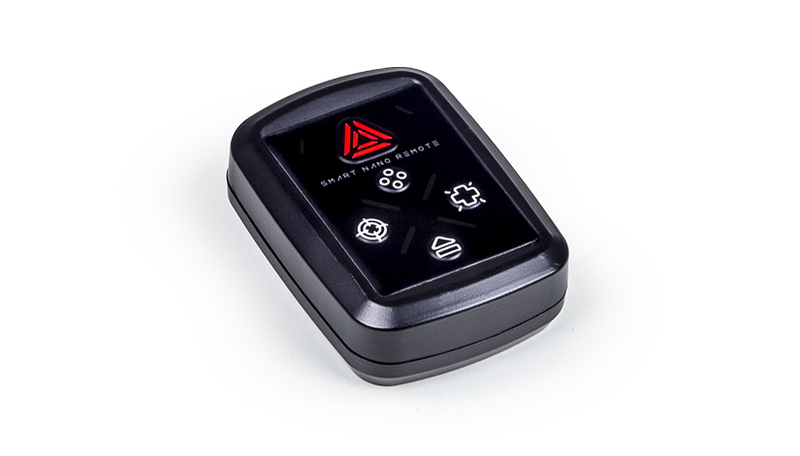 LASERWAR engineers decided to look for a compromise solution and after having analyzed a set of the most frequently used commands they made a new updated Smart Nano Remote. The new console did not increase in size very much, but its functionality grew 7 times! Now, using the new remote, you can trigger the 14 most frequently used commands. And all this can be done with 5 buttons. The four buttons are responsible for selecting the mode, and the fifth button will execute the selected command.